A Marsh Warbler at Holland House brightened up an otherwise uneventful day of birding, eventually finding its way into the mist nets along with the long-staying Icterine Warbler and a Collared Dove. 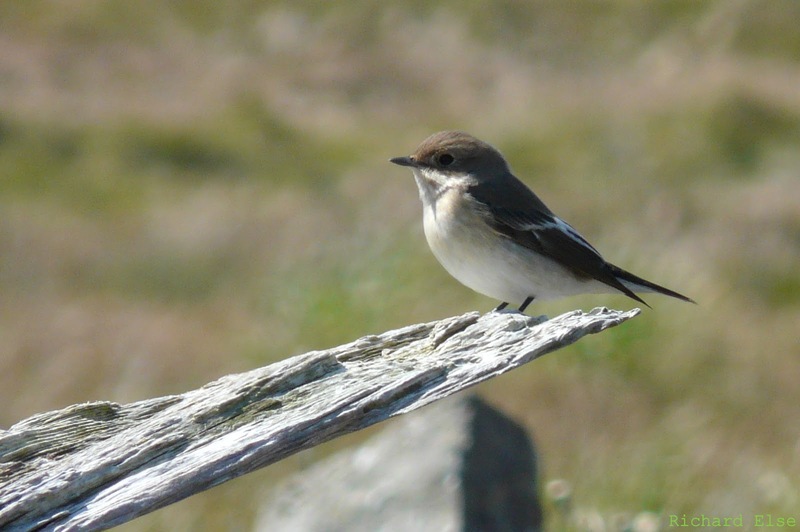 A couple of Swifts, a Sand Martin and 2 House Martins were seen, 2 Curlew Sandpipers were on Trollavatn and small migrants remaining from earlier in the week included a Ring Ouzel, a Whitethroat, a Lesser Whitethroat, a Robin and a Spotted Flycatcher. 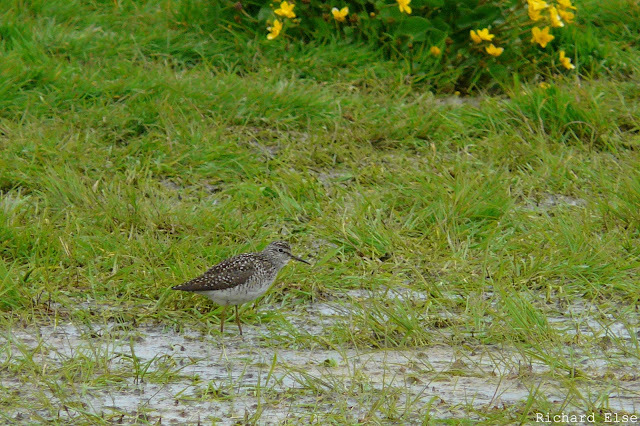 Although very quiet on the whole, the first Wood Sandpiper of the year was notable. The Little Gull and the Fieldfare both remained, and the only warblers seen were a Willow Warbler, 4 Chiffchaffs, a Blackcap, a Lesser Whitethroat and the lingering Icterine Warbler. The best bird of the day was a Common Rosefinch singing near the airfield early in the morning. A few other migrants were distributed very thinly around the island: a Cuckoo, a Ring Ouzel, a White Wagtail, a Dunnock, a Lesser Whitethroat and a Whitethroat were the most noteworthy. A new Curlew Sandpiper was seen, the Little Gull was still around Gretchen Loch, and an Icterine Warbler from several days earlier reappeared in a mist net at Holland House. 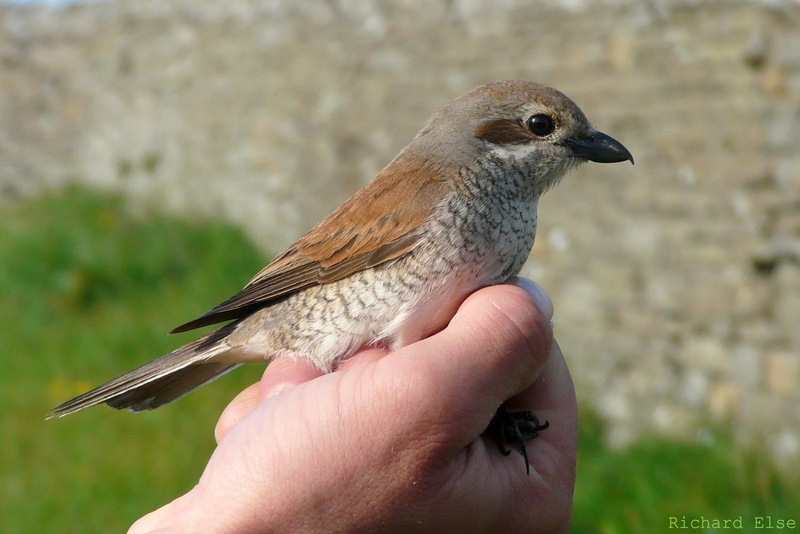 A couple of new Red-backed Shrikes, one of which was caught and ringed at Holland House, were the day's highlights, with only a sparse scattering of common migrants seen besides. These included a Lesser Redpoll, 3 other Redpolls, a Lesser Whitethroat, a Garden Warbler, a Fieldfare, a Swift, a Common Sandpiper and a Short-eared Owl. The Little Gull was still present, and 3 Collared Doves and a Woodpigeon were seen. It was a relatively uneventful day, but the 3 Temminck's Stints were still on their favourite scrape at Westness, the lone Dotterel had been joined by another bird, the first Ruff of the year was seen, a new Icterine Warbler was found at Bridesness and a Common Rosefinch was ringed at Holland House. There were few new migrants, but 3 Temminck's Stints at Westness easily made up for the shortage. The observatory has 6 previous records of this tiny wader, all of which involved just single birds. 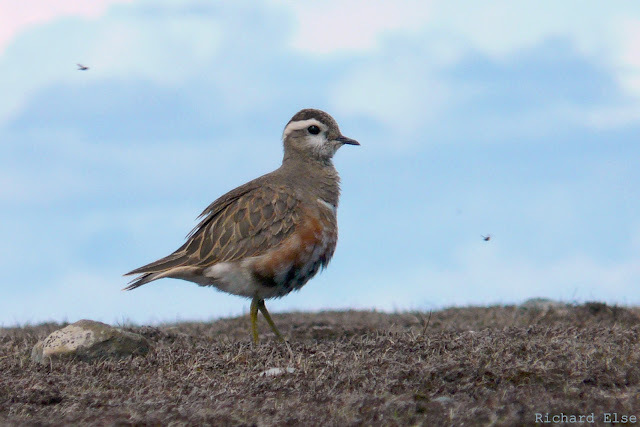 A Dotterel also near Westness may have been the bird seen earlier in the week; the Yellowhammer, the Little Gull, 2 Icterine Warblers and a single Red-backed Shrike were all lingering from previous days. Other sightings included a Lesser Whitethroat, 7 Spotted Flycatchers, a Tree Sparrow, a Tree Pipit, a Common Redpoll, 2 Sparrowhawks and a Short-eared Owl. A lot of the quality birds remained for another day of almost windless bright sunshine, and a few more notables dropped in to join them. A total of 8 Red-backed Shrikes included the 5 from the previous day, while there were a couple of new birds among at least 4 Icterine Warblers present. 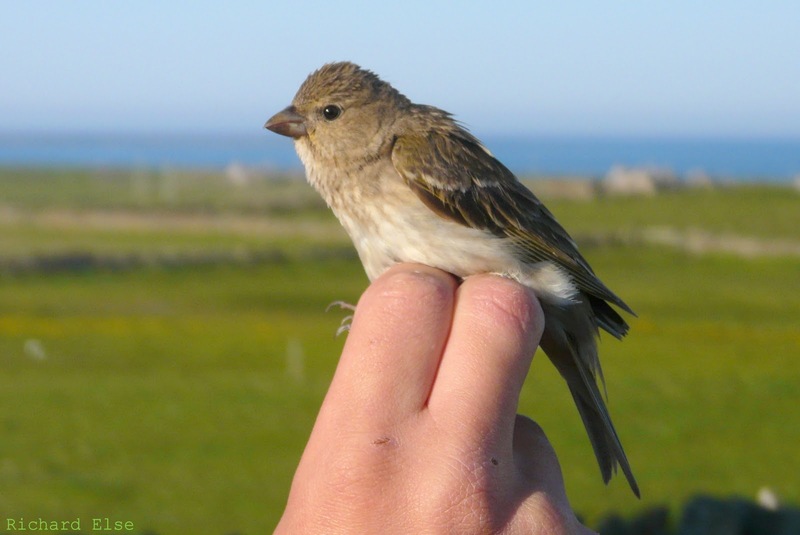 The first Common Rosefinch of the spring was near the old mill, and the year-list received further additions from a Cuckoo, a Little Gull and a bright Yellowhammer that was seen singing from the observatory roof. Counts of the commoner migrants stayed much the same, with 14 Spotted Flycatchers, 6 Lesser Whitethroats, 4 Whitethroats, 3 Blackcaps, 4 Willow Warblers, 8 Chiffchaffs 2 Tree Pipits, 1 Tree Sparrow and 1 Song Thrush seen. A slight increase in finches comprised 6 Redpolls, 3 Siskins, a Chaffinch and a Brambling; a couple of Rooks and a Carrion Crow passed through; other odds and ends included 2 Short-eared Owls, 2 Black-tailed Godwits, 3 Sparrowhawks, 3 Collared Doves and 2 Woodpigeons. Just one of the Red-backed Shrikes has found its way into the mist nets so far. 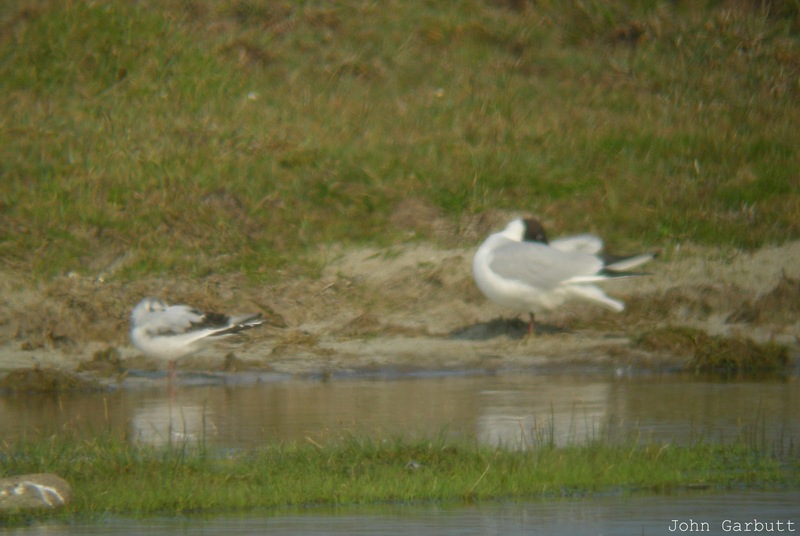 The first-summer Little Gull roosted with the Black-headed and Common Gulls on Gretchen Loch in the afternoon. Some of the late spring specialities made their appearance in another sunny day with plenty of migrants, a high proportion of which were scarce species. 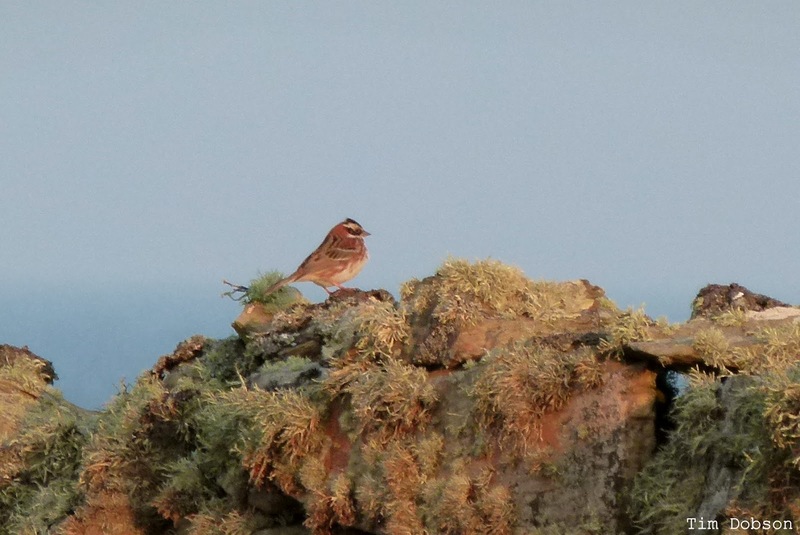 Top of the bill, although waiting right until late afternoon to be found, was a male Rustic Bunting near the lighthouse. A Red-breasted Flycatcher seen briefly on the west coast was a good find by a visiting tour group, and the first record for more than a year. The first 3 Icterine Warblers of the year also turned up in the afternoon, 1 of which was trapped at Holland House, and at least 5 Red-backed Shrikes were in the northern half of the island. 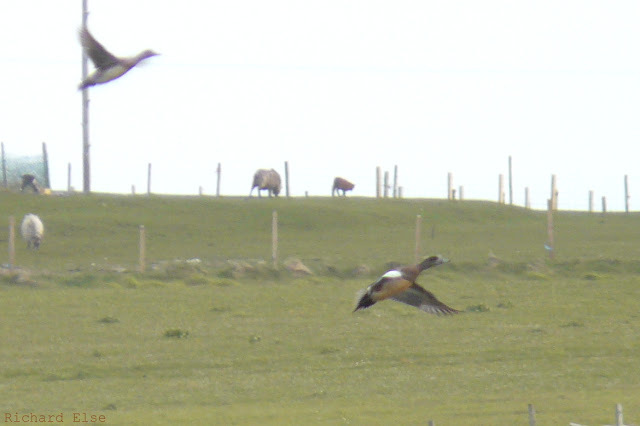 Another new Dotterel was seen and a Marsh Harrier flew south early in the morning. Additionally, a fair selection of common migrants were picked out from among all the scarcities, including 21 Spotted Flycatchers, 7 Lesser Whitethroats, 9 Blackcaps, 3 Garden Warblers, 8 Chiffchaffs, 6 Willow Warblers, 1 Whitethroat, 1 Redstart, 1 Song Thrush, 1 Tree Sparrow, 2 Chaffinches, 2 Redpolls and a Siskin. A Curlew Sandpiper and a Black-tailed Godwit remained, and 2 Short-eared Owls, 2 Sparrowhawks, 2 Woodpigeons, 5 Collared Doves and 19 Carrion Crows were also logged. Today's Rustic Bunting was roughly the 20th record for the observatory, and the first since May 2007. With continuing easterly wind and small numbers of birds arriving, there was disappointingly little of note to report. The highlight was probably 3 Curlew Sandpipers at Trollavatn, while 2 Black-tailed Godwits, a Yellow Wagtail, 3 Tree Sparrows (2 of which were new) and 2 Goldfinches were the best of the rest. Other count's from the day's log included 4 Sand Martins, 10 House Martins, 1 Redstart, 1 Song Thrush, 1 Lesser Whitethroat, 2 Whitethroats, 1 Garden Warbler, 9 Blackcaps, 1 Spotted Flycatcher, 11 Carrion Crows, 1 Siskin and 1 Common Redpoll. The 3 Woodpigeons and 2 Collared Doves were still here, and a Kestrel, a Sparrowhawk and a Merlin were the only raptors. It was another calm and clear day. A few migrants were around, although many more probably passed straight on to take advantage of the good weather. 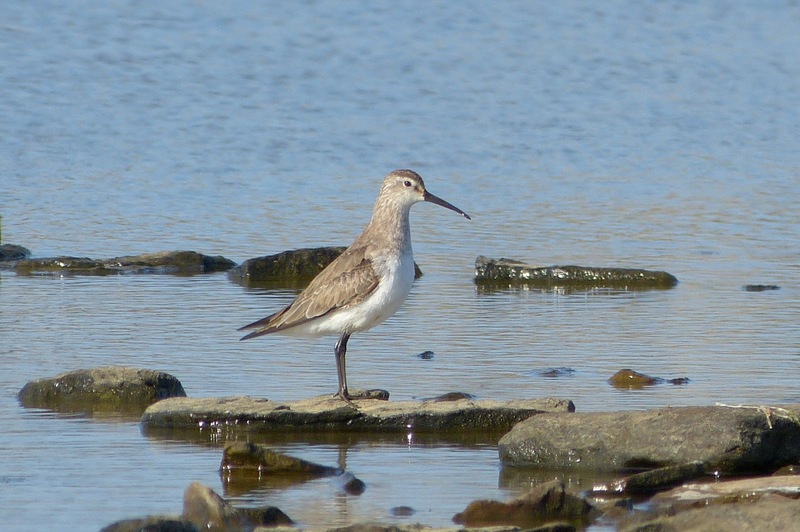 The most notable species were waders: the first Curlew Sandpiper of the year was on the golf course, and another new pair of Dotterels was found. Counts of some migrant passerines came to 7 Blackcaps, 4 Whitethroats, 7 Sedge Warblers (mostly breeding birds back on territory), 6 Chiffchaffs, 2 Willow Warblers and 2 House Martins; just singles of Sand Martin, Tree Pipit, Redstart, Ring Ouzel, Pied Flycatcher, Garden Warbler, Goldcrest, Tree Sparrow, Chaffinch, Siskin and Comon Redpoll were seen. Other sightings included 2 Pochards, a Sparrowhawk, a Kestrel, 3 Woodpigeons and 2 Collared Doves. The light easterly breeze did bring a small but varied assortment of migrants throughout the day. 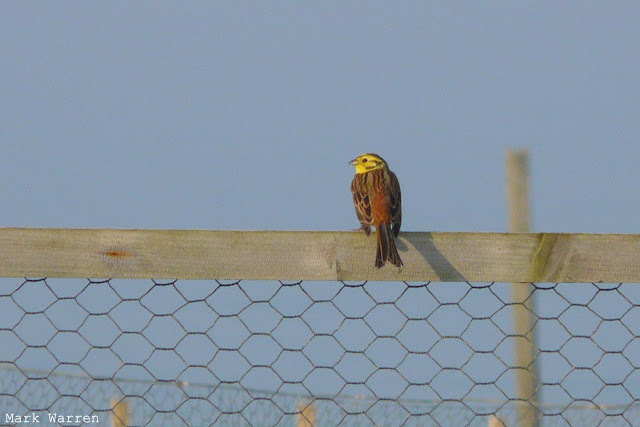 The best bird was a short-stay Shore Lark near Stennabreck that soon upped and disappeared west out of sight. 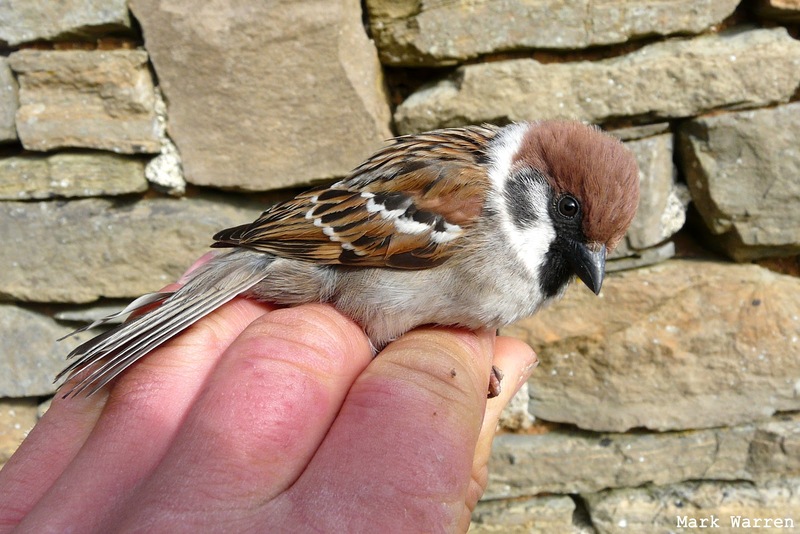 Other new birds for the year were an anticipated 10 House Martins and 2 Swifts, and a less anticipated flock of 5 Tree Sparrows at Holland House. The first really notable hirundine movement of the spring also involved 8 Sand Martins and 158 Swallows, while finches dropping in during the day included a Goldfinch, 2 Bramblings, 2 Siskins and a Redpoll. 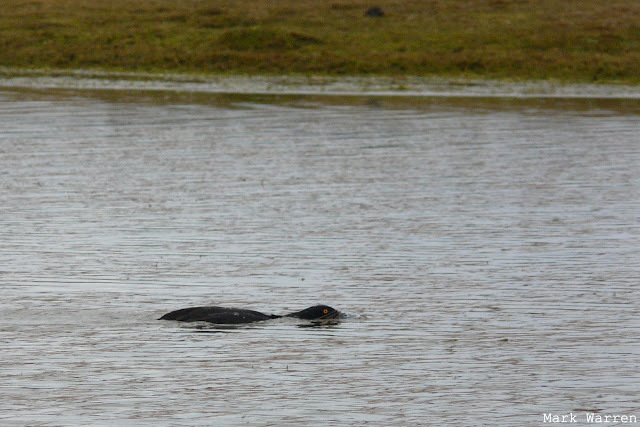 The / a drake Garganey was on Hooking Loch again, and the Reed Warbler from a week earlier made another appearance. Census counts of small migrant species came to 1 Tree Pipit, 2 Robins, 3 Whitethroats, 8 Blackcaps, 6 Chiffchaffs, 2 Willow Warblers and 1 Pied Flycatcher. A couple of Jackdaws and 11 Carrion Crows passed through, and 1 each of Sparrowhawk, Merlin, Common Sandpiper, Woodpigeon and Collared Dove were seen. Four of the five Tree Sparrows were ringed in the afternoon. 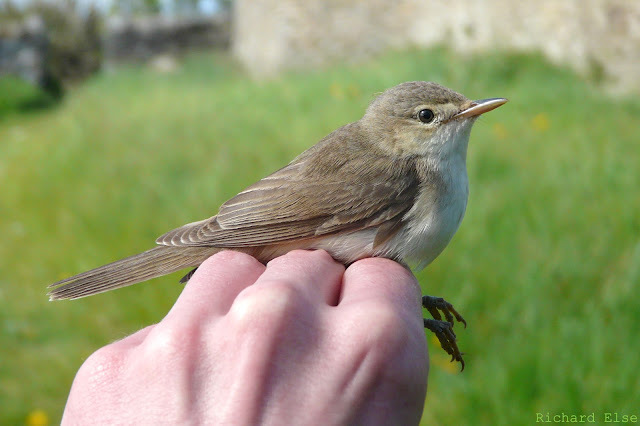 The Reed Warbler that has been lying low near the airfield for several days bears a non-local ring on its left leg. Little of note was seen, but calm conditions with a favourable easterly breeze had some promise of migrants to come. A Woodpigeon and 3 Sparrowhawks came in during the day, 3 Siskins were at Holland House and the 8 Blackcaps seen on census probably included a fresh migrant or two. 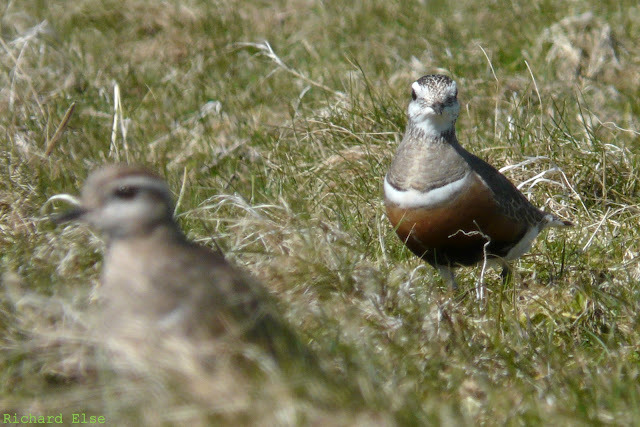 The 5 Dotterels were still present, 70 Knots remained from the big influx earlier in the week, and a couple of Tree Pipits and a Redstart were seen. Only three birds were caught during the evening's ringing session at Holland House. All three were Sparrowhawks. 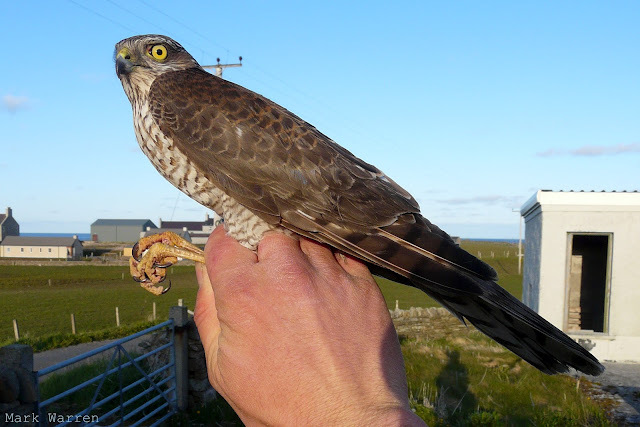 This takes the 2012 Sparrowhawk ringing total to a record-breaking 14 birds. A small number of fresh migrants arriving for a calmer day included a Black Redstart, a Garden Warbler, a Lapland Bunting and a couple of Common Sandpipers. A Glaucous Gull at Trollavatn was the first for a few weeks, and a single Pochard on Gretchen Loch might have been new. 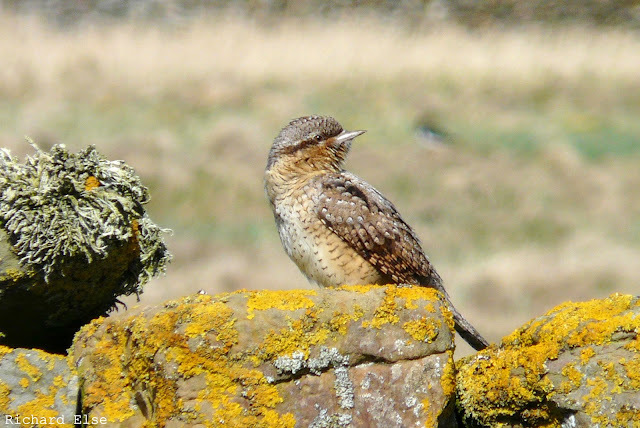 The Wryneck was still in the Westness area, and a Tree Pipit and 2 Redstarts also remained. 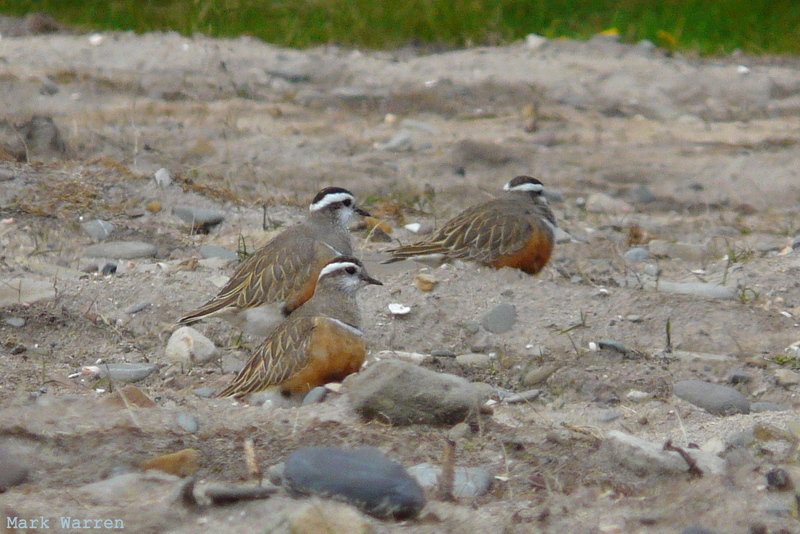 An approachable quintet of Dotterels in a sandy field near Westness was the highlight of an otherwise fairly quiet day. The first Common Tern of the year arrived, a Black-tailed Godwit was with a small group of Bar-tails, a couple of Whinchats included one apparently new bird and a Wryneck was still present at the north of the island. Other non-movers included 2 Tree Pipits and 4 Redstarts. Foul weather for the morning thwarted most birding plans; a seawatch in the afternoon produced 23 Manx Shearwaters and lots of Puffins, but none of the northbound skua passage we were hoping for. The American Wigeon was still on Hooking Loch, and the crowds of waders included 349 Knots - the second highest count of the species ever recorded here. The American Wigeon, Garganey and Wryneck were all still present, but there was little else to report besides 5 Tree Pipits, 3 Redstarts and 4 Collared Doves among a rapidly diminishing collection of migrants. An unpromising windy and wet morning was followed by a brighter afternoon and several great birds were found. Pick of the bunch was a drake American Wigeon that dropped into Hooking Loch with a small number of Wigeons. Hooking Loch, clearly the place to look for wildfowl this year, also hosted a drake Garganey and a Canada Goose among the more usual variety of species. Nearby, a smart Pectoral Sandpiper was found among the Dunlins feeding on the golf course and a male Blue-headed Wagtail was seen. 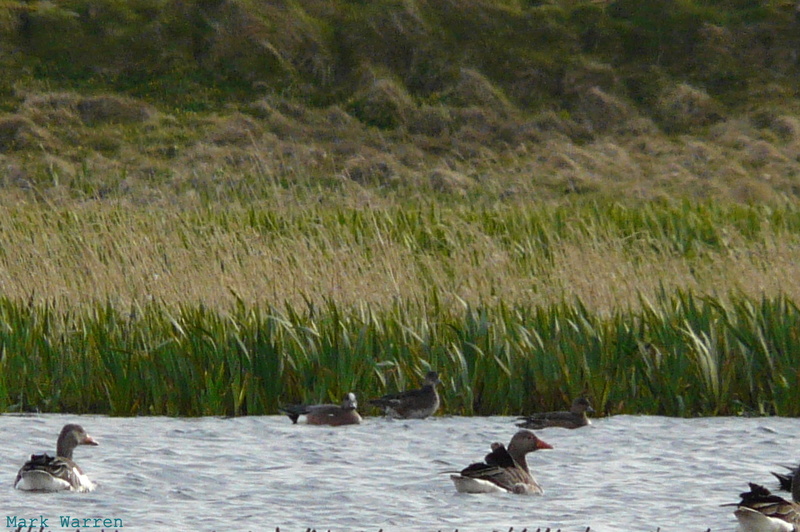 The American Wigeon was only the fourth record of the species for North Ronaldsay, and the first since 2004. 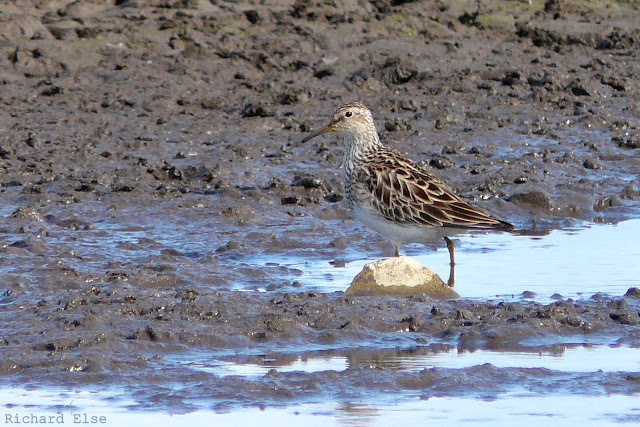 The Pectoral Sandpiper appeared quite a brightly marked bird, and is probably a different individual to the one that visited on 5th May. 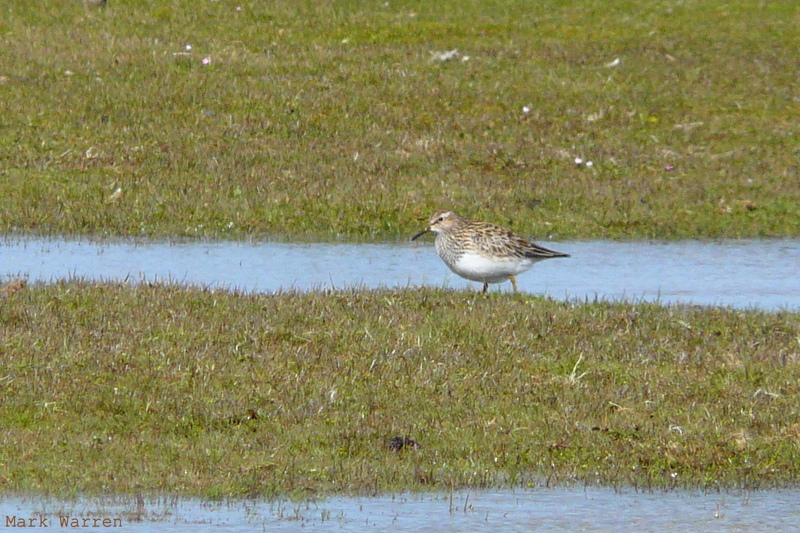 Unlike that bird, and most other Pec Sands here, which tend to frequent small inland areas of wetland alone, it chose to spend its time with the large numbers of coastal waders on the links. The day's other sightings included 2 Sparrowhawks, 3 Short-eared Owls, a Wryneck, a Black Redstart, the second Reed Warbler of the year and a Lapland Bunting. The Chaffinch, a Brambling, 3 Redstarts, 18 Tree Pipits and 209 Wheatears were among the counts of other, mostly lingering, migrants. Wader numbers continued to increase to impressive levels, with 213 Knots, 672 Sanderlings, 75 Dunlins and 951 Turnstones seen around the coast. Strong wind and incessant rain put an end to most thoughts of birding for the day, but a short wander around the south-west part of the island found that some migrants had come in. A Chaffinch and 4 Collared Doves were new, as appeared to be a few Whitethroats and Tree Pipits. A Wryneck was still present near the observatory. 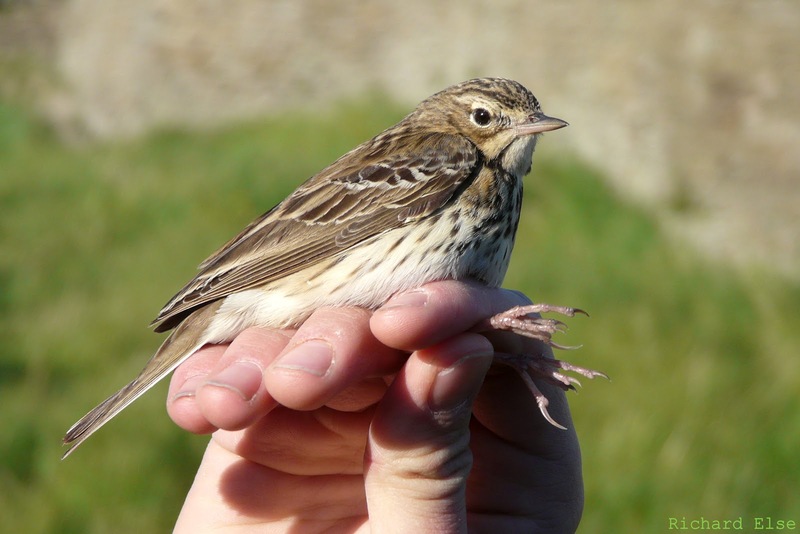 Once again, plenty of birds were still around from earlier in the week to brighten the daily census, and a small number of freshly arrived migrants included some species of interest. An elusive Corncrake was heard singing near the airfield during the morning, although it couldn't be relocated later on. The first Crossbill for over a month was a notable sighting, and 2 Goldfinches and a Greenfinch were also uncommon finches. New raptors included 2 ringtail Hen Harriers and a Sparrowhawk. The male Red-backed Shrike was still around the north of the island. Counts of some small migrants, the majority of which were lingering birds from previous days, came to 22 Tree Pipits, 4 White Wagtails, 10 Robins, 8 Redstarts, 1 Whinchat, 193 Wheatears, 3 Ring Ouzels, 2 Lesser Whitethroats, 5 Whitethroats, 6 Blackcaps, 27 Willow Warblers and 4 Chiffchaffs. A couple of Herons flew in and spent the day on Ancum Loch, 5 Carrion Crows appeared and a mass arrival of Arctic Terns brought more than 300 to the island. We have ringed 11 Tree Pipits already in 2012, equalling the best ever annual total. Good numbers of birds still remained, and a few more new ones included the second Wood Warbler and Yellow Wagtail of the spring and a pair of Pintails. The Wryneck was still at Bridesness, and migrant counts included at least 24 Tree Pipits, 3 White Wagtails, 12 Redstarts, 3 Whinchats, 1 Ring Ouzel, 7 Whitethroats, 1 Garden Warbler, 12 Blackcaps, 60 Willow Warblers, 7 Chiffchaffs, 3 Pied Flycatchers and the same Lapland Bunting. A Woodpigeon arrived, while a Short-eared Owl, a Collared Dove and a Kestrel remained from previous days. As the overall number of migrants remaining from earlier in the week continued to dwindle, there were still a few new birds to keep things interesting. 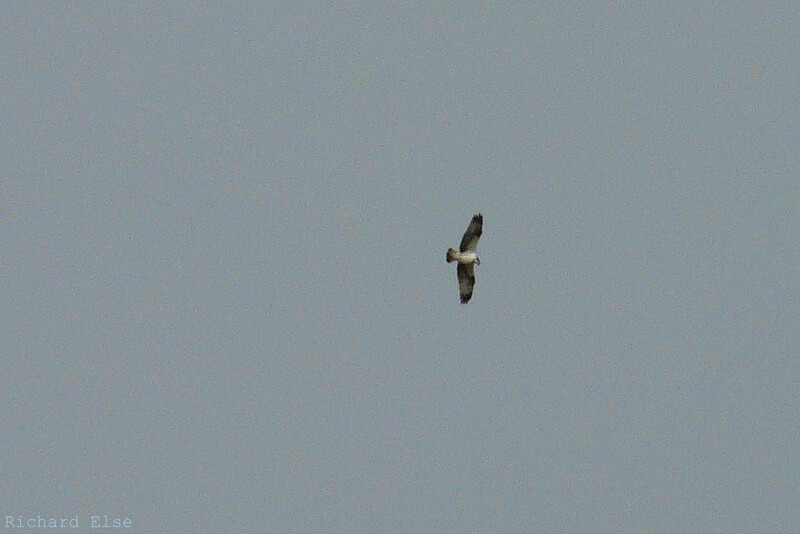 The bird of the day was a raptor again. This time it was an Osprey circling far above Hooking Loch before climbing even higher and drifting off to the south. A new Wryneck was near Trollavatn, and 2 others seen on census were assumed to be lingering birds. A Black Redstart and a Short-eared Owl were also notable new sightings. 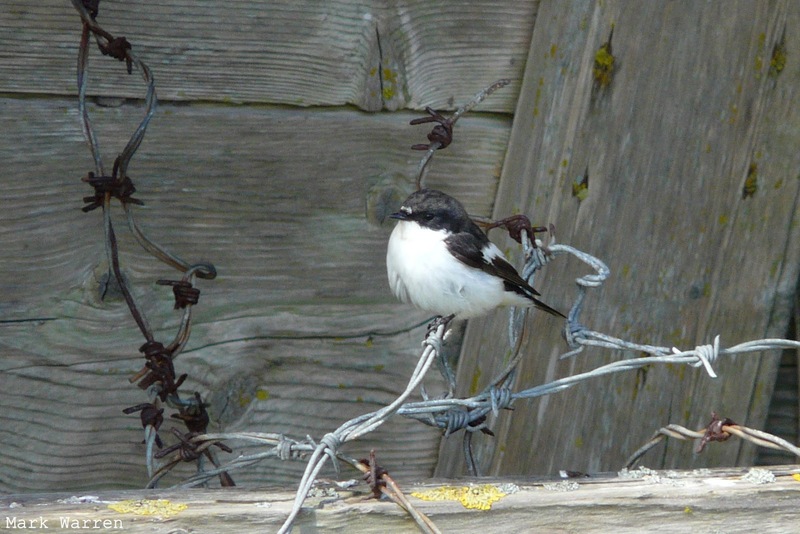 Counts of commoner migrants included an increase to 82 Swallows, 27 Tree Pipits, 25 Redstarts, 4 Whinchats, 233 Wheatears, 4 Ring Ouzels, 15 Blackcaps, 52 Willow Warblers, 1 Spotted Flycatcher, 1 Pied Flycatcher, 4 Common Redpolls and a single Lapland Bunting. A Collared Dove and a Heron were fresh migrants, and at least 1 Kestrel was still around. The number of waders built yet further, and included an impressive count of 1,866 Turnstones - a new record count for the island. Another fantastic day of birding included some good new birds, as well as plenty of leftovers from the previous day's fall. The highlights were a female Marsh Harrier over Brides Loch in the afternoon, the first Reed Warbler and first 2 Spotted Flycatchers of the year, 2 Wrynecks (1 new, 1 from the day before), and 3 Grasshopper Warblers. 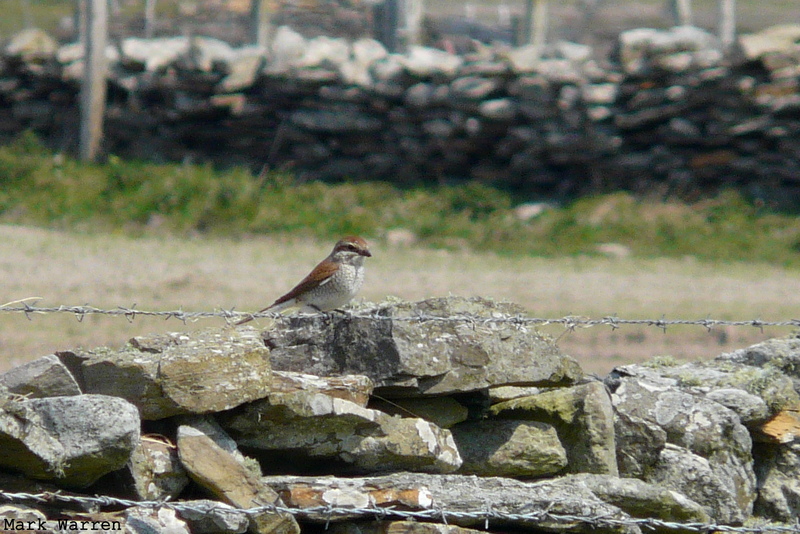 The Red-backed Shrike was still at the north of the island. Wheatears reached a new high of 360 birds and Tree Pipits increased to at least 41. Counts of other small migrants included 100 Willow Warblers, 8 Chiffchaffs, 18 Blackcaps, 10 Whitethroats, 2 Sedge Warblers, 10 Pied Flycatchers, 27 Redstarts, 3 Whinchats, 16 Robins, 4 Dunnocks and 4 White Wagtails. A Sand Martin was the first for more than a month; 40 Fieldfares, 15 Song Thrushes, 12 Ring Ouzels and 3 Redwings made up a good selection of thrushes; and finches included 6 Bramblings and 2 each of Siskin and Common Redpoll. 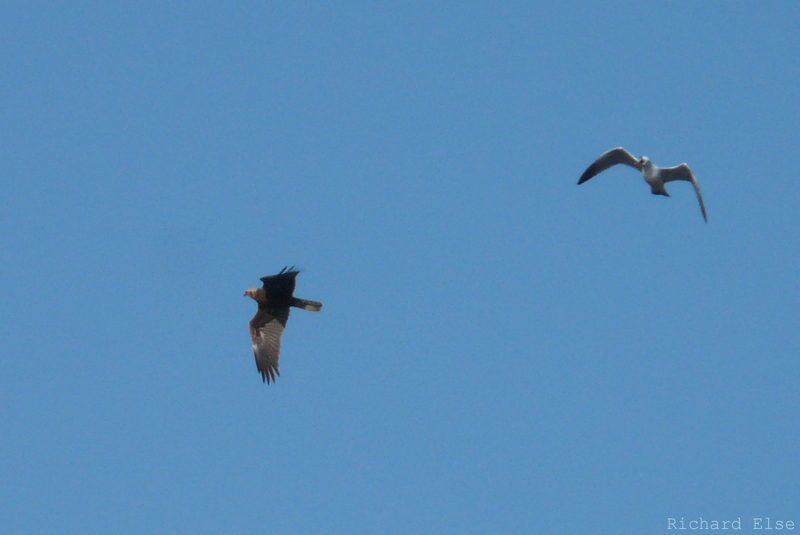 As well as the harrier, raptors were represented by 2 Kestrels, 2 Sparrowhawks and a Merlin. A Common Scoter was in Linklet Bay, and 7 Common Sandpipers were around the coast. Roll up, roll up, there's a Circus in town! A spectacular fall of myriad migrant species, 10 of which were new for the year, was the product of the magic combination of strong overnight easterlies coupled with heavy rain. When conditions brightened in the afternoon, the rocks and walls on the west side of the island were teeming with birds. 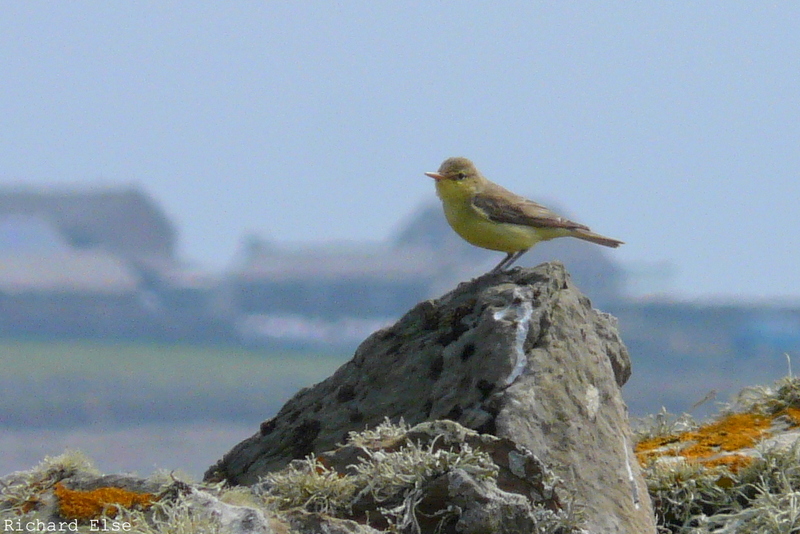 Although only about half of the island was covered on census, counts of the more numerous species included 294 Wheatears, 122 Willow Warblers, an impressive 54 Redstarts, 44 Blackcaps and 33 Tree Pipits. The most notable species present were a male Red-backed Shrike, 5 Wrynecks, a Grasshopper Warbler, and a Wood Warbler. The long list of other small migrants included 6 Pied Flycatchers, 6 Whinchats, 10 Ring Ouzels, 25 Fieldfares, 15 Song Thrushes, a Redwing, 18 Robins, 3 Dunnocks, 2 White Wagtails, 4 Sedge Warblers, 3 Lesser Whitethroats, 12 Whitethroats, a Garden Warbler, 17 Chiffchaffs and a Goldcrest. There were 3 Lapland Buntings and 10 Reed Buntings, while 24 Bramblings, 6 Siskins, and a couple of Redpolls were new finches. Non-passerines didn't get much of a look in, but 4 Common Sandpipers were the first of the year, 13 Whimbrels were seen, a Woodpigeon was new and the 3 Dotterels and 4 Pochards were all still present. A very welcome day of perfect calm and sunshine, respite from the recent Arctic conditions, brought very little by way of passerine migrants. Fortunately, the non-passerines included some more quality to save the day once again. 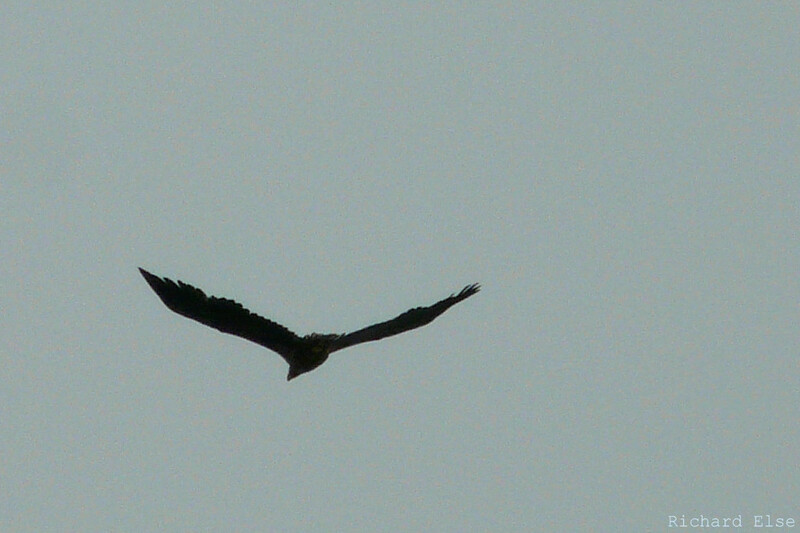 A White-tailed Eagle - the second record of the year, considered a different individual to the first - spent some time circling very high above the island before drifting back towards the rest of Orkney. The first 3 Dotterels of 2012 made their predictable appearance in the traditional Dotterel hotspot of Tor Ness; a Wryneck was ringed at Holland House; and the Slavonian Grebe was still in Linklet Bay. 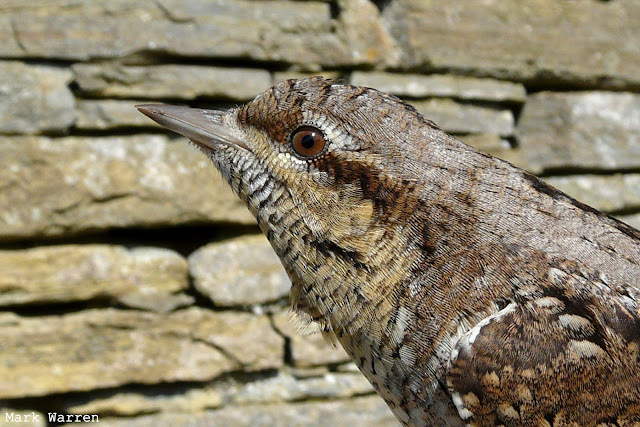 This was the fourth Wryneck of the spring, and the first to be ringed here in more than a year. Amid another day of icy hail showers, a White-billed Diver lingering near the seawatching hide was the highlight. This is the fourth one of the year, and the third breeding-plumaged adult. Noteworthy Aythya sightings were 4 Pochards on Gretchen Loch and a group of 7 Scaups on the sea near Westness, the latter being one of the highest counts of the species ever recorded here. Also at sea were the Slavonian Grebe from the previous day, a blue-phase Fulmar and a Manx Shearwater. A new Lesser Redpoll was the best of a thin landbird selection that also included 5 Snow Buntings and 15 Twites, while progressively swelling numbers of waders saw Turnstones reach a year-high of 735 birds and the arrival of a new Grey Plover. The local Tufted Ducks have been observed in some curious behaviour of late, as they attempt to escape notice on a puddle near the lighthouse. Another day of cold northerlies and occasional hail showers nevertheless brought a few good birds. The pick of the bunch, and a bit of a surprise, was a Pectoral Sandpiper in a muddy scrape near Hooking Loch. Although now fairly regular in autumn, this is only the fifth spring record of the species for the observatory. A summer plumaged Slavonian Grebe in Linklet Bay was also notable, and only the second May record here; and a female Garganey was seen at Hooking Loch. An increase in Wheatears resulted in a count of 84, and other small birds included 4 Lapland Buntings, 6 White Wagtails and a Ring Ouzel. A couple of Sparrowhawks and a Whimbrel were also seen. 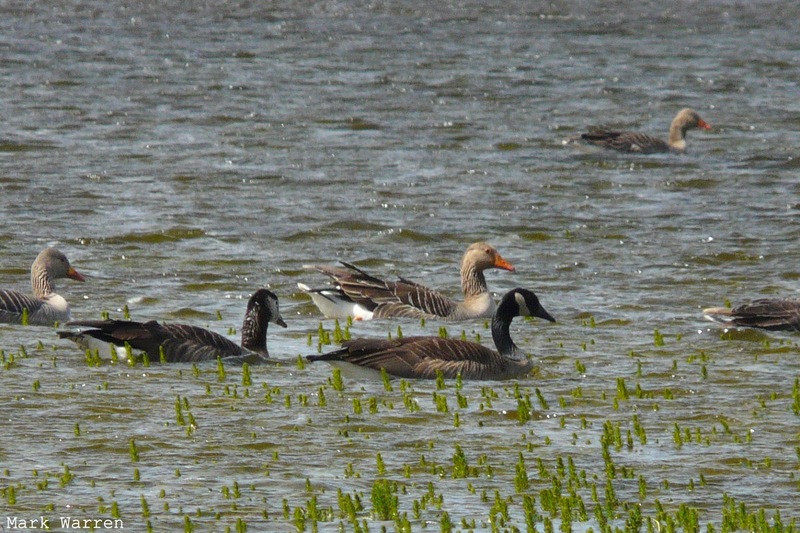 The long-staying, probably nesting, Canada x Greylag Goose hybrid was still around, and 2 more geese of the same hybrid combination appeared from who-knows-where among the local Greylags. 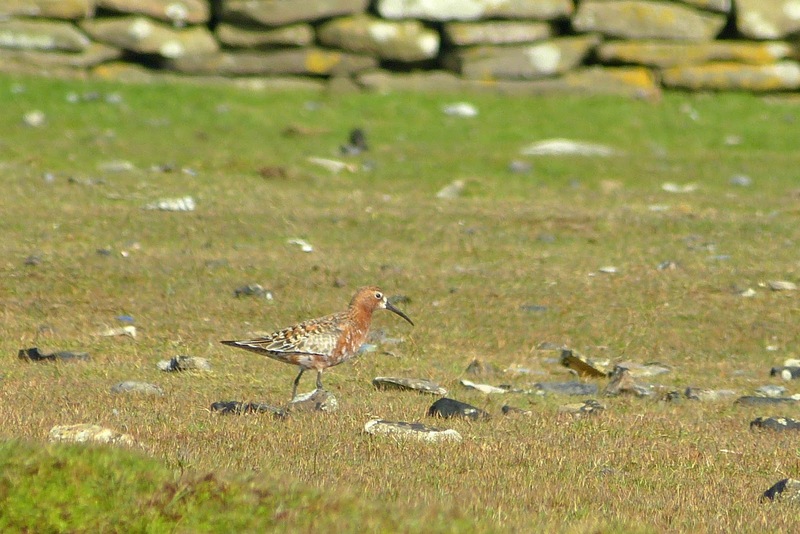 Very few new birds were around in bitterly cold northerly winds. A count of 80 Wheatears included a few fresh arrivals, a Siskin, a Song Thrush and a Sparrowhawk were seen and 10 Knots were on the east coast of the island. Arriving from the south and not deigning to hang around for long, the bird of the day, a young White-tailed Eagle, made a brief aerial tour of the island just before midday, soon returning back across the water towards Sanday. This is a typical date for the species here, and White-tailed Eagles have arrived in late April or early May in several recent years. 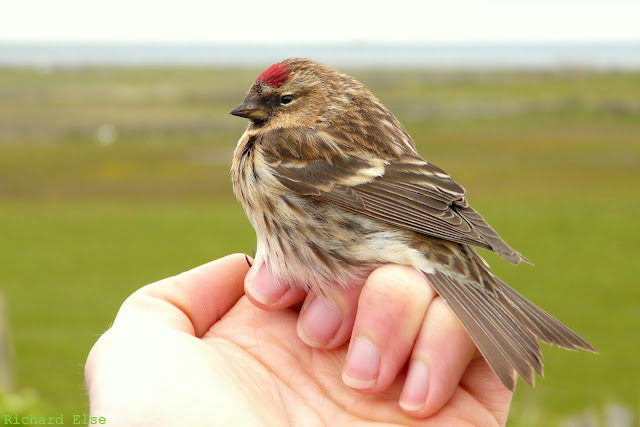 Other additions to the year-list were a Lesser Redpoll ringed at Holland House and 5 Arctic Terns in Linklet Bay. Also notable was the number of waders present, with counts of 459 Sanderlings, 116 Ringed Plovers and 16 Dunlins showing a clear increase. Other sightings included 2 Lapland Buntings, 10 Siskins, 2 Common Redpolls, a Brambling, 5 Blackcaps, 2 Willow Warblers, 2 Chiffchaffs, a Peregrine and the same Scaup. The main feature of a perfectly calm day was a fantastic number of divers swimming offshore, mostly in the channel between North Ronaldsay and Sanday. Counts came to an impressive 82 Great Northern Divers, 20 Red-throated Divers and a single Black-throated Diver; although, disappointingly, the White-billed Divers were nowhere to be seen, denying us the satisfaction of getting the complete set. Besides lots of loons, it was another quiet day on census. A few small migrants were scattered around, including 2 Ring Ouzels, 2 Song Thrushes, 3 Chiffchaffs, 2 Willow Warblers, 13 Swallows, 3 Siskins and 3 Redpolls. A few passage corvids included a Rook, 6 Carrion Crows and about 20 Hooded Crows, while 3 Whimbrels, 2 Collared Doves and a Woodpigeon were also new. May, often an exciting month for birding at a migration hotspot, began very quietly. The vast majority of Robins and Dunnocks had moved on, and only a very small number of common migrants were seen. These odds and ends included 2 Sparrowhawks, 2 Whimbrels, a Woodpigeon, 8 Swallows, a Brambling, 2 Siskins and a Redpoll. A Willow Warbler, 2 Blackcaps, 3 Chiffchaffs and a Goldcrest were the only warblers.